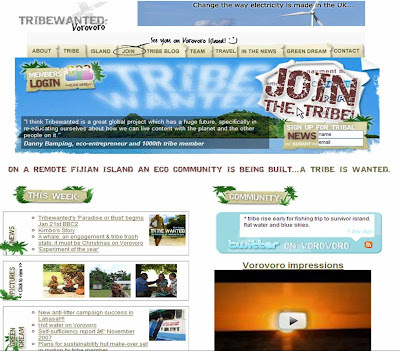 Tribewanted is a unique community tourism project that is simultaneously based on Vorovoro Island, Fiji and online. Starting in 2006 and running for 3 years, Tribewanted is living alongside the small indigenous Mali community on Vorovoro to build a simple, sustainable village. The project has been brought to life using social media. People from around the world were then encouraged to get involved through www.tribewanted.com and intrepid travellers could register through the website and if approved could visit for two to twelve weeks (though some stayed even longer!) The elected chiefs, Tribewanted team and visiting members all met on-line before beginning their journey to Vorovoro and as of January 2008 four hundred members aged 4 to 67, had visited Vorovoro. Over 1300 members from 35 countries have now joined Tribewanted.com online network. Members have debated and voted on how the on-line and on-island communities should be structured. Each month a tribe member is elected to be the online tribe's chief on Vorovoro. The chief works alongside the team on Vorovoro to make sure the project progresses. Tribewanted.com is a great example of the new breed of social networks that are coming through - social networks with a purpose. Rather than being a communication utility like Facebook where the social network is the 'end', for sites like tribewanted.com (and newer launches like Dopplr) social networking technology is the means. Tribewanted has been followed by media from around the world and a 5-part BBC observational documentary called “Paradise or Bust” starts on 21st January 2008 on BBC2 at 9pm . Newspapers are also covering Tribewanted with features in Guardian Weekend, the Sunday Times and Daily Express appearing soon. Online there is a Tribewanted Facebook group and a large number of Tribewanted photos on Flickr.